In recent years, the cost to provide health insurance coverage to state employees and retirees has increased considerably. The state will pay $1.3 billion for these health insurance premiums in 2002 and $1.7 billion in 2003. We review actions the Public Employees' Retirement System is taking to control these rising costs and highlight legislative options to further limit the state and enrollee costs for the health insurance program. We also recommend steps to further ongoing legislative oversight of the program. Like many employers, the state provides health insurance coverage for its employees. In addition, the state provides health insurance for retirees from state service. The state pays most of the monthly premiums for this coverage. In recent years, health care costs have escalated nationwide. A number of factors have contributed to these increases. Some of these factors are out of the control and influence of the state as a buyer of health insurance coverage, while other factors are subject to state control. This report looks at what the Public Employees' Retirement System (PERS), which administers the state program, is currently doing to control the state's health insurance costs for its employees and retirees. It also examines what the Legislature can do to control these costs. Throughout this report, we focus on the health program as it impacts the state. However, these issues and any program changes also would impact local governments that contract with PERS for health services. The types and level of services covered. The level of user fees, or "copays." The types of insurance offeredfor example, health maintenance organization (HMO) plans and preferred provider organization (PPO) plans. Currently, PERS offers enrollees a choice between seven HMOs and two PPOs. (As we indicate later, the number of HMOs available to PERS enrollees in 2003 will decline to three.) In addition, PERS offers three PPO options for specific groups of employees (primarily highway patrol and correctional officers). Enrollees who are 65 years of age or older must enroll in the Medicare-coordinated plans offered by each HMO and PPO. Younger enrollees are enrolled in the "basic" (non-Medicare) plans. The health services covered by the participating HMOs and PPOs are virtually identical. There are more than 1.2 million individuals covered under the PERS health insurance program, 60 percent of whom are state members, with the remainder being local government members. HMO Versus PPO Plans. There are important similarities and differences between HMOs and PPOs. They are similar in that both types of organizations contract with specific sets of doctors, hospitals, and other health care providers to provide services to enrolled members. Also, both HMOs and PPOs attempt to manage the delivery of health care services to members, although the extent of this control is less under PPOs. And herein lies a significant difference between these plans. The HMOs require the provision of care through a primary care provider who determines whether referrals to specialists are warranted. By contrast, PPOs permit enrollees to obtain services from specialists without referral. Other differences exist between HMOs and PPOs. In general, an HMO enrollee who receives services outside of an HMO network has to pay the entire costs of those services. In contrast, the PPO enrollee who obtains services outside of the provider network would not pay the entire cost of the services, although he/she would pay a greater portion than if the service had been delivered by a contracted provider. Finally, HMOs tend to prepay providers a per-capita rate for each enrollee (known as capitation), while PPOs generally pay providers on a discounted fee-for-service basis. Because of these differences, HMO coverage tends to be less expensive than PPO plans. The PERS contracts with HMOs (such as Kaiser Permanente and Blue Shield) to offer HMO plans to employees and retirees at premiums negotiated by PERS and the individual companies. Thus, these HMOs bear the financial and legal risk of administering these health plans if, for example, revenues do not cover expenses. On the other hand, PERS bears the financial and legal risk of operating the two PPO plans it offers. This type of arrangement is known as self-insurance and is not uncommon among large employers. Premiums Set in Spring for the Next Calendar Year. The PERS staff negotiates premiums with the HMOs at the beginning of each calendar year for the following calendar year. These negotiated premiums are then reviewed and approved by the PERS board during the spring. For example, the premiums that will be in effect for 2003 were negotiated and approved during the first part of 2002. All contracting HMOs must provide the same set of covered services, as designated by PERS. The negotiated premium for each HMO is the same throughout the health plan's service area and does not vary from one region of the state to another. As indicated above, PERS does not contract with health plans for the PPOs. Instead, PERS is responsible for administering the program (with the aid of contracted third-party administrators) and setting premiums at sufficient levels to cover medical costs. As with the HMOs, the PERS board also sets PPO premiums in the spring for the next calendar year. aNo longer available for 2003. Existing law declares that the state's purpose in providing health insurance to its employees and retirees is to promote increased efficiency in state government by (1) attracting and retaining employees through providing health plans similar to those available in the private sector and (2) protecting the state's labor investment by maintaining employees' good health. In 2002, the total cost (state and employee contributions) of health insurance premiums for state employees and retirees will be about $1.6 billion. This includes about $1.1 billion to provide coverage for active employees and their dependents and more than $500 million for retirees and their dependents. Of the total amount, the state will pay more than $1.3 billion while employees and retirees will pay the remainder. Figure 1 shows the growth in the state's share of costs since 2000. We estimate that the total 2003 cost for health insurance will exceed $2 billion, with the state paying $1.7 billion of this amount. State Contribution for Employees Subject to Collective Bargaining. Current law requires the state contribution for employees' health insurance premiums to be determined through collective bargaining. The Department of Personnel Administration (DPA) establishes the state contribution for those employeesincluding managers and supervisorswho are not subject to collective bargaining. Under new memoranda of understanding (MOUs) approved by the Legislature for all 21 bargaining units, the monthly state contribution for 2002 is $190 for one-party, $378 for two-party, and $494 for family enrollment. This amounts to the state paying 85 percent of health insurance premiums for employees and their dependents. Employees pay the remaining 15 percent. Statutory Formula Determines State Contribution for Retirees. On the other hand, current law requires the state to pay 100 percent of a weighted average premium for retirees and 90 percent of the additional premiums for their dependents, depending on years of state service. This is known as the "100/90 formula." The weighted average premiums are calculated based on the premiums of the four health plans with the highest enrollment. This calculation results in monthly state contributions of $216 for one-party, $411 for two-party, and $525 for family enrollment in 2002. (If the premium for the health plan selected by a retiree is lower than these maximums, the state pays the lesser amount.) This amounts to the state paying 81 percent of premiums for retirees and their dependents. State Cost for Employees' Coverage "Buried" in Departments' Budgets. While the state annually pays a substantial amount for its share of health insurance premium costs for state employees, the total cost to the state cannot be easily identified in the budget. This is because funding for these costs is spread throughout the budget. Specifically, the bulk of the state's cost for employee coverage is included in the base budgets of individual departments, as part of personal services costs. However, the additional costs that the state has to pay as health insurance premiums grow from one year to the next are separately appropriated in a lump sum in the annual budget act (under Item 9800, Augmentation for Employee Compensation). This amount supplements the baseline allocations embedded in individual departmental budgets. Pursuant to annual budget language, the Department of Finance allocates the appropriated amount for the higher premiums to individual departments' budgets. For 2002-03, the budget includes $163 million for the state's portion of premium increases. When allocated to individual departments, these additional health insurance costs also become buried in departments' baseline budgets in the subsequent year. 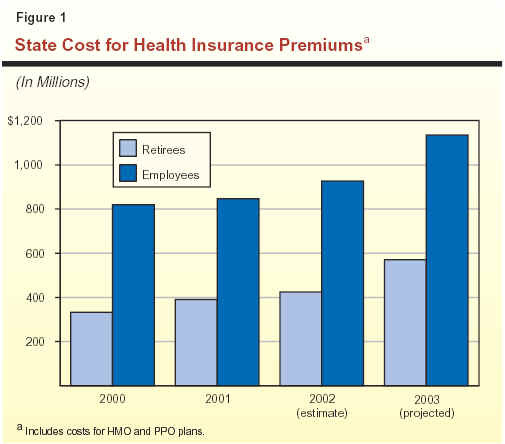 We estimate that state costs for current employees (excluding the portion of premiums paid by employees themselves) are approaching $1 billion in 2002, as shown in Figure 1. State Cost for Retirees' Coverage Appropriated in Budget Line Item. In contrast, the annual budget act includes a line-item appropriation (under Item 9650, Health and Dental Benefits for Annuitants) for state retirees' health insurance costs. (Although PERS administers the program on a calendar-year basis, the state appropriates funding for its share of costs on a fiscal-year basis.) This provides the Legislature the opportunity to review these premium expenditures during budget hearings. The budget includes $577 million for these state costs in 2002-03. Additional Program for Higher-Cost Rural Areas. The total cost to the state to provide health insurance for state employees and retirees is, in fact, somewhat more than the $1.3 billion for premiums cited above for 2002. This is because in recent years, HMOs have dropped rural areas from their service territories for a number of reasons, including the higher cost of care in those regions compared to urban areas. In particular, factors driving up rural costs have included greater use of costly regimens in treating medical conditions and fewer available doctors and hospitals. (Please see our report HMOs and Rural California for a more detailed discussion of this issue.) As a result, state employees and retirees who live in these rural areas must enroll in one of the higher-cost PPO plans, which are available statewide. Consequently, state employee and retiree enrollment in PPOs has increased. In order to provide insurance at a similar level of cost to all enrollees (including those in rural areas), the state established the Rural Health Care Equity program, administered by DPA. This program subsidizes health care costs for employees and retirees in rural areas. Generally, the program reimburses (1) out-of-pocket health care costs that would normally be covered by an HMO, such as deductibles and co-insurance payments (typically a percentage of the cost of service), and (2) the difference in premiums between the lower cost of the two PPO plans available to those eligible and the average HMO premium. The budget act includes $32 million for this program in 2002-03 (under Item 8380, DPA). The growth in PPO enrollment also drives up the state's health insurance costs in another wayindirectly, via the weighted average premium formula used to calculate the state's contribution for retirees' premiums. Because HMOs have withdrawn from rural areas, one of the state's PPO plans now is among the top four in enrollment. As a result, this higher-cost PPO plan now drives up the state contribution for retirees' premiums at a faster rate than previous increases. Like other employers, the state has experienced escalating cost trends for health insurance. As a result, premiums have grown considerably in recent years. 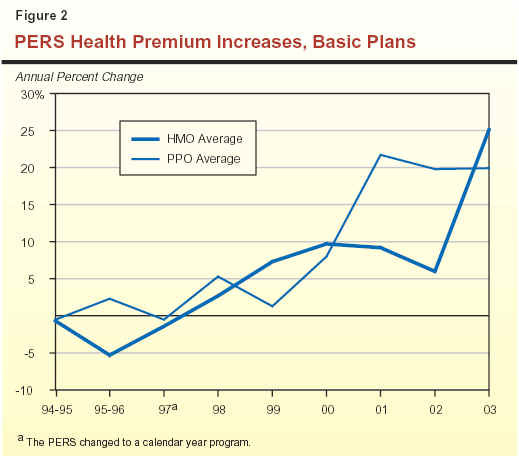 Figure 2 (see next page) shows the average premium increases adopted by PERS from the mid-1990s through 2003 for the basic (that is, non-Medicare) HMO and PPO plans. As Figure 2 shows, HMO premiums have increased by more than 5 percent annually since 1999. In 2000, the increase approached 10 percent. The increase in HMO premiums dampened for 2002 as a result of plan changes adopted by PERS to increase enrollees' out-of-pocket usage fees ("copays") for office visits and prescription drugs. Without these plan changes, the average HMO premium increase would have been 13 percent instead of 6 percent. The high 25.1 percent jump for 2003 reflects the current cost pressures on the health care system, as described below. Figure 2 shows that from 2000 through 2002, average premiums have increased even more dramatically for the two PPOs administered by PERS. This reflects mainly PERS' efforts to restore the plans' financial solvency, which has been strained by growing costs and high enrollment growth. The PERS began these efforts to "catch up" plan reserves in December 2000. At that time, because of the trend toward increased levels of treatment and growing enrollment due to HMO withdrawals from rural areas, the PPOs faced $9 million more in costs than they had in reserve. In 2002, PPO premiums increased by an average 19.8 percent, and PERS adopted a 19.9 percent increase for these plans for 2003. Increasing cost and use of prescription drugs. Higher payments to doctors and hospitals for patient care. Greater levels of treatment provided to and used by patients (including new high-cost technologies). These factors are expected to continue driving up the cost of health care and therefore health insurance premiums. Based on these recent trends, last fall PERS estimated annual premium increases of 15 percent for the HMO and PPO plans from 2003 through 2005, absent changes in program structure. However, recently concluded premium negotiations for 2003 resulted in much larger-than-anticipated 25.1 percent and 19.9 percent increases for HMOs and PPOs, respectively, as noted above. 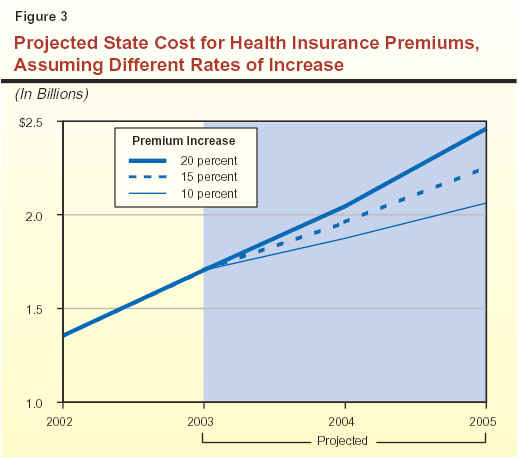 Figure 3 shows the cost to the state if premiums increase at PERS' estimated 15 percent rate for 2004 and 2005, assuming the state continues to pay its current share of health insurance premiums. The figure also shows the cost to the state if premiums were to increase at lower (10 percent) or higher (20 percent) rates. As shown in the figure, the PERS projection of 15 percent would result in state costs increasing from $1.3 billion in 2002 to more than $2.2 billion by 2005. On the other hand, if premiums increase at a smaller annual rate of 10 percent, the state's cost would be just over $2 billion in 2005. An annual increase of 20 percent would result in state costs of nearly $2.5 billion by 2005. Given the magnitude of these costs, significant dollar savings are possible with even small reductions in premium growth. Specifically, a 1 percent reduction in premium costs would save the state around $20 million. HMOs Dropping Rural Areas Pushes Up Cost. As discussed earlier, HMOs have dropped certain rural areas entirely from their service territories because of the higher cost of care in those regions compared to urban areas. Individuals in these counties without HMOs must enroll in more costly PPO plans administered by PERS, which are available statewide. Figure 4 shows the counties that currently do not have any HMOs under the PERS program. (There may be HMOs serving private sector employees in these counties, but not state employees and retirees.) 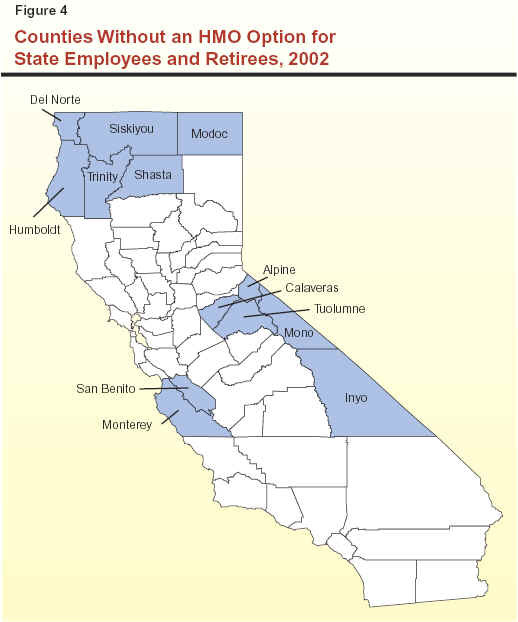 In 2002, as a result of HMOs leaving rural areas, state employees and retirees in 13 California counties no longer have an HMO option. This number will grow to 15 in 2003 with the planned withdrawal of HMOs from Lassen and Tehama Counties. In addition, parts of nine counties are without an HMO, and this number will also grow to 15 in 2003. Despite its relatively small share of HMO enrollment in California (5 percent to 10 percent for each HMO), PERS has, to date, been successful at keeping premium increases down. In the 1990s, PERS negotiated very low premium increases and even reductions in some years. More recently, as discussed earlier, premium growth has been quite sizable, largely due to widespread health care cost pressures. Historically, PERS has successfully negotiated some of the lowest HMO premium increases in the country. For example, the Kaiser Family Foundation reported that monthly premiums for private sector employer-sponsored HMO coverage in California jumped 9.9 percent for 2001, compared to PERS' 9.2 percent increase. For 2002, federal government employees' health insurance premiums rose 13 percent. Similarly, members of the Pacific Business Group on Health, which purchases insurance on behalf of large and small businesses, faced 10 percent to 20 percent jumps. At the same time, PERS negotiated a 6 percent average premium increase for its HMOs in 2002. As part of its efforts to limit cost pressures during HMO contract negotiations for 2002 premiums, PERS rejected the original proposals submitted by HMOs because of the magnitude of premium increases requested. Proposed increases for the basic plans ranged from 5.5 percent to 41 percent, averaging 23.3 percent. Instead, PERS required the HMOs to resubmit lower bids for the existing plan design, as well as provide bids for two alternative plan designs that would help limit premium costs. The PERS also announced that it would only contract with up to seven health plans to be selected based on various performance statistics and price. Figure 5 shows the weighted average premium increases for the original and resubmitted bids for the existing plan design, as well as for the alternative plan design that PERS subsequently adopted. a Seven adopted HMOs only. In the end, PERS contracted with seven HMOs, eliminating three from its list of 2001 contracts, and adopted the alternative design that increased enrollees' copays to further limit monthly premium increases. Specifically, PERS increased copays for doctor's office visits from $5 to $10, which is the most common amount among California businesses, according to a Kaiser Family Foundation survey. It also implemented a three-tiered prescription drug copay schedule to encourage enrollees to use less expensive generic and mail-order drugs. The PERS had not changed these provisions since the early 1990s. The PERS estimated that rejecting the initial bids and requiring the health plans to resubmit new bids lowered total HMO premium costs for state employees and retirees by $105 million. Adopting the higher-copay plan further dropped the premium increase to 6 percent. This shaved another $82 million off the cost, according to PERS. Tiered hospital coveragewith copays ranging from $100 to $1,000 per admission or per day for choosing nonpreferred, more expensive hospitals. Changes in prescription drug coveragewith higher copays (up to 50 percent for brand-name prescriptions) and higher annual maximum for drug costs paid by the enrollee. In the end, the PERS board rejected any plan design changes that called for smaller premium increases and higher out-of-pocket costs for enrollees. Instead, the board voted to contract with only the five HMOs with the smallest premium increases, eliminating two HMOs from its 2002 choices for enrollees. (Subsequently, two of the five HMOs could not meet conditional requirements regarding their financial stability and therefore were not included in the 2003 state program.) This reduced the average premium increase to 25.1 percent. The PERS estimated that reducing the number of HMOs it contracts with will save $45 million for state employees in 2003. However, total estimated HMO premiums will still jump by nearly $300 million to $1.3 billion. What Else Is PERS Considering? Beyond its actions relating to the 2002 and 2003 premiums, PERS is pursuing additional options to rein in growing premium costs. These options, which are not mutually exclusive, include the following. Prescription Drug "Carve-Out." To address escalating drug costs, PERS is investigating the feasibility of having a separate carve-out contract for prescription drug coverage for some or all of the HMO plans beginning in 2004. Under this arrangement, individual plans would not provide pharmaceutical coverage. Instead, there would be a separate contract with one provider to supply prescription drugs for all HMO enrollees. Currently, one company provides prescription drug coverage for both PPO plans. By contrast, each HMO provides prescription coverage as part of the plan. Under this option, bidders for the new contract to provide prescription coverage to PPO enrollees would have to be able to serve HMO enrollees as well beginning as early as 2004. Until PERS determines an estimate of savings from a pharmacy carve-out contract for HMO enrollees, the likelihood that PERS will implement this option remains unclear. Data Warehouse Project. The 2002-03 budget includes first-year funding of $3.5 million for PERS to develop a Health Care Decision Support System (HCDSS). The project involves the purchase of off-the-shelf software to establish a "data warehouse" consisting of information on the use of medical services and prescription drugs by those enrolled in the PERS health program. One-time acquisition costs would total $6.2 million, with $3.3 million in ongoing annual costs to support the system beginning in 2004-05. The PERS indicates that medical and pharmaceutical claims information from HCDSS would be used to improve patient care and help contain increases in health insurance premiums by identifying the most prevalent and costly illnesses, the most effective treatment regimens, and individual health plans' treatment costs. The PERS anticipates HCDSS to be functioning in 2004 so that PERS could use data from the system in negotiations for 2005 health insurance premiums. Specifically, it is anticipated that PERS would know actual treatment costs for each HMO with which it contracts. This information would be used to negotiate premiums that better reflect actual cost trends. The PERS estimates ongoing premium savings from HCDSS that would accumulate from year to yearan estimated additional $10 million in savings each year. Regional Premiums. The PERS has also considered adopting some form of "regional rating" so that premiums reflect the actual cost of service in various areas of the state. Currently, each health plan has a uniform statewide premium schedule for all of its service areas. However, under a regional rating structure, PERS would divide the state into a number of regions and allow HMO premiums to vary among regions based on actual treatment costs. This could induce HMOs to provide services in higher cost rural areas, and reduce the impact on total premiums resulting from the withdrawal of HMOs from rural areas. County-specific information from PERS demonstrates the variability in treatment costs, which would be reflected, to some degree, in premium charges under this proposal. For example, per-member monthly HMO treatment costs range from $109 in the urban south (San Diego, for example) to $159 in rural areas (Shasta, for example), with a statewide average of $120. Monthly PPO treatment costs per member range from $171 in the suburban south (Riverside, for example) to $189 in the urban north (Contra Costa, for example), with a statewide average of $183. The HMOs have indicated to PERS that full regional rating, under which premiums reflect actual costs, may mean that they could stay in their existing rural areas. This is because full regional rating would reduce the cost uncertainty associated with HMOs' existing service territories by allowing the plans to charge premiums that are in line with their costs in these more expensive areas. However, HMOs have also indicated that a regional rating system would not induce them to restore service to areas from which they have already withdrawn. This is because HMOs have expressed a lack of interest in reentering high-cost rural areas under the current PERS program. Consequently, although regional rating could help stem the tide of HMO withdrawals from high-cost rural areas, it would likely not reverse the pull-outs that have already occurred. Fewer Plan Choices, But Statewide Coverage. The PERS is also considering two major proposals that would further limit the number of health plan choices of enrollees. These proposals would, however, ensure that the limited choices are offered statewide, thereby eliminating the problem of HMOs pulling out of rural areas. Nonetheless, PERS is only beginning to develop these proposals and the likelihood of eventual implementation is uncertain at this time. The first proposal would include three HMO choices with service territories covering the entire state, instead of HMOs in only selected parts of the state as is the case currently. Under the second option, the state would, like other states and large employers, become self-insured for all enrollees instead of just for PPO members. The program would offer two or more insurance products (an HMO and a PPO plan, for example). The PERS estimates significant cost savings for each of these proposals. As PERS considers these program design changes, current law leaves the Legislature out of the process of determining the provisions of the state's health insurance program for its employees and retirees, as well as how much to pay for it. PERS Establishes Health Insurance Program. Existing statute requires the PERS board to establish the scope and content of health benefits plans, taking into consideration (1) the "needs and welfare" of employees and the state and (2) "prevailing practices" in prepaid medical and hospital care. No legislative review of the health plan design is required. State Cost for Employees Reflects Administration's Priorities. Under current law, the state contribution for employees' health insuranceestimated to surpass $1 billion in 2003is determined through collective bargaining. Agreements the administration reaches with the bargaining units on this item reflect the administration's priorities. Typically, negotiated MOUs reach the Legislature at the last minute before the end of session and are often not reviewed in committee hearings. This occurs despite a statutory requirement that MOU provisions requiring an appropriation must be approved in the budget act. In practice, the Legislature has little opportunity to consider state expenditures in this area. The PERS has over the years successfully negotiated some of the lowest premium increases among large employers. However, given rising costs in the health care industry, the Legislature may want to reconsider whether this broad delegation of authority continues to meet the state's needs and priorities in the most cost-effective manner. There are different approaches the Legislature could use to strengthen its oversight. For example, the Legislature could take a one-time action to direct PERS to develop particular coverage choices or have annual budget oversight hearings on health insurance costs for state employees and retirees. Alternatively, the Legislature could direct PERS to report on the implicationsin terms of cost and coverageof the various alternative plan designs that PERS is currently considering. To provide the Legislature with ongoing information on a multibillion dollar program, we recommend the following actions. Annual Report in Budget Hearings. The Legislature should require PERS to report annually in budget hearings on (1) the total costs to provide health insurance for state employees and retirees; (2) the trends, cost factors, and forecasts for the health care sector; and (3) the steps PERS is taking to address health care costs and other identified issues. This would facilitate ongoing legislative oversight of the program. Based on the information provided by PERS, the Legislature could also determine on an as-needed basis whether to hold additional in-depth policy and fiscal hearings. We believe that such oversight hearings are warranted, given that the costs of the program are increasing dramatically and PERS is moving toward a more consolidated program structure with fewer plan choices for enrollees. Both types of hearings would provide the opportunity for the Legislature to direct PERS' efforts to reflect legislative priorities and to make policy changes in the health insurance program for state employees and retirees. Consolidated Display in Governor's Budget. We also recommend that the Governor's budget bring together in one location a consolidated informational presentation of total health insurance costs for state employees. This would improve legislative oversight of total state expenditures for this purpose. This is similar to how the state has dealt with expenditures across multiple departments for the CALFED Bay-Delta program. Specifically, the informational display should list the number of state employees enrolled and the cost of health insurance, broken down by (1) HMO and PPO enrollment and (2) agency. This would make it easier for the Legislature to identify the growth of program expenditures. Such a consolidated display, together with budget information currently provided on health insurance coverage for retirees, would give the Legislature a more comprehensive picture of the state's health insurance costs for current and past employees. In addition to increasing oversight, we identify two primary ways that the Legislature could limit total costs for employee and retiree health insurance premiums paid both by the state and by enrollees. The first approach focuses on developing lower-cost HMO options. This approach emphasizes the development of health plan choices that limit total premiumsboth those paid by the state and by enrollees. The second option changes the way state contributions are determined. In particular, it focuses on the collective bargaining process and the statutory formula for retirees. In structuring the state's health insurance plans, PERS, unlike some states such as Missouri and Oregon, has required that contracting HMOs offer a standardized package of services that are covered with specified copays. Thus, the HMOs compete with one another only on price and quality of service provided, not on the types of services offered. As a result, unlike other forms of insurance such as auto or homeowners' coverage, enrollees do not have any option within the HMO choices to decide how much insurance they want. For example, enrollees cannot choose a plan that reduces their monthly premiums by having fewer covered services, a $100 or $250 per-admission copay for hospitalization or surgery, or a higher copay for doctor visits. To offer more consumer choice and potential premium savings for enrollees and the state, the Legislature could examine the feasibility of offering an alternative, lower-cost health insurance option to state employees and retirees. Such an option, for example, could require each contracting HMO to provide one lower-cost and one higher-cost plan to enrollees, instead of just one standardized plan. (Although PERS required HMOs to submit proposals with two plan designs for 2002, the differences included only relatively minor changes in doctor visit and prescription drug copays.) In fact, the current two PPO plans are already structured in such a manner. One plan offers lower monthly premiums than the other in exchange for greater cost sharing for medical services. Specifically, the lower-premium PPO generally requires enrollees to pay 20 percent of health care costs up to a specified amount, whereas the higher-premium plan requires enrollees to pay just 10 percent of health care costs. The lower-cost options would reduce enrollees' out-of-pocket premium costs to the extent the plan's premium is above the maximum state contribution. In addition, these options could reduce state contributions to the extent that there are more plan options that cost less than the maximum state contribution. However, developing lower-cost HMO options would not address the lack of HMO coverage in rural areas. There are also a number of ways that the Legislature could change how the state contributions for health insurance premiums are derived, with the potential for reducing state costs depending on how the changes are structured. Adopt Formula for State Employees. Prior to 1974, state law prescribed a specific dollar amount (increased periodically) as the state's share of employee health insurance premiums. In 1974, the Legislature changed the state's contribution for health insurance to 80 percent of the average premium for employees and retirees and 60 percent for their dependents. This formula was subsequently increased to 85/60 in 1975 and finally to 100/90 in 1978. However, in 1978, the Legislature also allowed the state contribution for employees' health insurance premiums to be determined through collective bargaining, which typically concludes after the budget is completed. Unlike state costs for retirees which is governed by the 100/90 formula, the state's cost for employees is unknown when the budget is approved. While total cost is a significant issue with this program, the uncertainty of how much the state will pay is another key issue. To eliminate some uncertainty regarding the amount the state has to pay for its employees, the Legislature could again adopt a formula for calculating the state contribution for employees. In fact, the Legislature recently attempted to do this. In 2001, the Governor vetoed AB 1554 (Hertzberg), which would have applied the 100/90 formula to state employees. The PERS estimated that this would have cost an additional $64 million in 2002, or about 7 percent of current state expenditures for employee health insurance. The Legislature could consider a contribution formula for employees other than the 100/90 formula envisioned by AB 1554. A formula resulting in reduced state costs would not be outside the norm for contributions by California businesses, the state itself in the past (as noted above), or other states. In 2002, PERS estimates that the state will pay an amount equal to 85 percent of total health insurance premiums for employees and their dependents. According to a 2002 Kaiser Family Foundation survey, businesses in the state pay the equivalent of 90 percent of one-party premiums and 79 percent for family enrollment. In addition, a 2001 survey of state government health benefits reported that a majority of states cover less than 75 percent of dependent premiums. Thus, California pays a similar portion of employee and dependent premiums as businesses in the state, but a higher portion of dependents' premiums than other states. We also did a nationwide survey of states, of which 14 responded. Our survey shows that of the responding states, most pay a greater portion of employee premiums but a smaller portion of dependent premiums than California does (see Figure 6). In addition, only five negotiate state contributions through the collective bargaining process. Specifically, a number of states including Iowa, Maine, Oregon, and Texas pay 100 percent of employee premiums and anywhere from zero to 80 percent of dependent premiums. Others like Nebraska, Nevada, and Vermont pay the same portion, ranging from 75 percent to 80 percent, for employees and their dependents alike. New York pays 90 percent of employee premiums and 75 percent of dependent premiums. Drawing from these findings, if the state adopted an 85/75 formula for employees and their dependents, we estimate that state savings in 2003 would be about $16 million. Alternatively, with a 100/50 formula, the state would save approximately $70 million. Adopting a statutory formula would not impact overall premium increases. Rather, it would determine what portion of premiums would be paid by the state. In addition, depending at what level a formula is fixed and what the administration would have otherwise negotiated in collective bargaining, it would also not necessarily reduce state premium costs. It would, however, eliminate some uncertainty regarding how much the state will pay from year to year. Change 100/90 Formula for Retirees. Our survey shows that while 8 of the 14 states listed in Figure 6 pay some contribution for retirees' premiums, only four of them contribute toward dependent premiums. In comparison, California uses the 100/90 formula to calculate the state portion of premiums for retirees and their dependents. State Pays Less Than California For . . .
Coverage Provided For . . .
a Respondents to LAO nationwide survey. b Maine's contribution for dependents is determined through collective bargaining. c Washington pays a specified dollar amount for retirees enrolled in Medicare. As discussed previously, the state provides health insurance for its employeesboth active and retiredin order to attract and retain them and to protect this labor investment. This is to help achieve the goal of having a more efficiently run government. While the prospect of having state-paid health insurance in retirement may influence some to work for the state, we find little analytical basis for the state to contribute more for retirees' health insurance premiums than for current employees' premiums. However, this is precisely the case, as shown in Figure 7.
a Determined by collective bargaining. b Determined by the 100/90 formula. State expenditures for retirees' health insurance have jumped 33 percent since 2000 to an estimated $424 million in 2002 because of both enrollment and premium growth. To control this expenditure growth in the future and to create a more balanced relationship between state contributions for employee and retiree premiums, the Legislature could change the 100/90 formula as discussed in more detail below. However, it appears that the formula could only be changed prospectivelythat is, for state employees beginning service after the formula changes. This is because court decisions have often considered employer contributions for retirees' health benefits to be part of the employment contract as guaranteed compensation. As a result, changing this contribution for current employees and retirees is likely to be determined by a court to be a contract violation. The Legislature has prospectively changed this contribution in law twice before. From 1978 through 1984, the 100/90 formula applied to all current and future retirees. Then the Legislature changed state law for employees first hired on or after January 1, 1985. These individuals would not be eligible for the full amount of the 100/90 formula contribution in retirement until they worked for the state for ten years (instead of five years as under prior law). Another law change effective January 1, 1989, made new employees starting after that date eligible for just half of the 100/90 formula contribution in retirement after ten years of state service. These individuals would then be eligible for an additional 5 percent of the formula amount with each additional year of state service, up to the full amount after working for the state for 20 years. The Legislature could similarly adopt another contribution schedule for retirees to apply to new state employees hired after some future date. Alternatively, the Legislature could set the state's monthly contribution for retirees' health insurance premiums at the same dollar amount as that negotiated for employees through collective bargaining. Any savings would be prospective though, once those new employees retire. Thus, there would be no near-term savings from changing the contribution for retirees now. Strengthen Incentive to Choose Lower-Cost Plans. The Legislature could also consider significantly strengthening the incentive for both employees and retirees to select lower-cost plans. One way to achieve this is by setting the state's contribution at some portion of (or equal to) the monthly premium of the lowest-cost plan available in each county. (The state contribution may vary depending on what plans serve each county.) While PERS requires health plans to meet certain standards to be approved for the state program, the premiums vary from one plan to another. The Legislature could send a strong, clear signal encouraging employees and retirees to choose lower-cost health plans by tying the state contribution to the lowest-cost plan available. If individuals believe that other options provide better care or otherwise better meet their needs, then they could pay the difference in premium for a more expensive health plan. We recognize that this option could cause the state contribution for health insurance to vary by county to the extent that the lowest-cost health plan is not offered statewide. For example, because it lacks HMO service, the state contribution for employees and retirees in Trinity County would be tied to the premium of the lower-cost PPO plan available there. On the other hand, the state contribution in Ventura County would be tied to the lowest-cost HMO plan available there, which has a smaller premium than the PPO plans. Thus, the state contribution in Trinity County would exceed that in Ventura County if such an option were currently in effect. Such variation in compensation is not without precedent. For example, the state currently offers pay differentials for hard-to-fill positions based on criteria such as location. Varying the state health insurance contribution based on available health insurance choices would similarly reflect local economic and employment conditions. If implemented, this option should be coordinated with the existing Rural Health Care Equity program. This would avoid compensating eligible employees for the HMO-PPO premium differential already addressed by the higher state contribution for rural areas that would be adopted under this option. There are other options the Legislature may wish to consider or have PERS investigate. For example, the state could consider consolidating prescription drug purchasing for all state departments. Currently, PERS contracts for prescription coverage for state employees and retirees, while the Department of General Services contracts on behalf of other departments such as Corrections, Mental Health, and Developmental Services for their prescription drug needs. In addition, and at a more macro level, the Legislature may wish to study the feasibility of consolidating the state's separate purchases of health insurance coverage for programs such as PERS, Medi-Cal, and Healthy Families. These options may help maximize the state's negotiating leverage as a large purchaser of health coverage, thereby enabling the state to achieve better prices and lower costs. An annual report from PERS in budget hearings on (1) the total costs to provide health insurance for state employees and retirees, (2) health care cost trends and forecasts generally, and (3) PERS actions to address growing program costs and other identified issues. A consolidated informational display of total health insurance costs for state employees in the annual Governor's budget. Change the way state contributions are determined. To request publications call (916) 445-4656.